More Recall Woes For J&J Include Rolaids, Children's Benadryl : Shots - Health News A House committee investigation into Johnson & Johnson's spate of recent recalls continues for now, but when Republicans take over the committee in January, that could change. Tummy still a bit unsettled after the big eating holiday? Reach for the Rolaids carefully. About 71,500 packages of the over-the-counter antacid have been recalled for quality problems -- not a lot of product -- but it's the latest in a seemingly endless parade of problems with medications made by pharmaceuticals giant Johnson & Johnson. This latest recall was announced the Monday before Thanksgiving, a time when people were probably paying more attention to travel plans and gravy recipes than to bad news about popular remedies. In November 2009, J&J’s McNeil unit recalled Tylenol Arthritis Pain formula, because the product had a musty, moldy odor. The company blamed a chemical used to treat shipping pallets. Last January, more Tylenol, as well as Motrin, Rolaids, St. Joseph aspirin and Benadryl allergy tablets after people complained of a musty odor. Some people suffered nausea and vomiting from using the musty medications. FDA officials said J&J knew about the musty problem in September 2008 but held off on reporting it to the feds for a year. Millions of doses of the popular children's remedies Motrin, Tylenol, Zyrtec and Benadryl were recalled at the end of April, after FDA investigators found bacterial contamination, lax quality testing, and inadequate worker training at a plant in Pennsylvania. Parents were told to buy generics instead. It was the largest recall of children's medications in the history of federal oversight, with 70 percent of the market for liquid medications affected, according to the FDA. In a contentious hearing on Capitol Hill, the FDA accused J&J of using a "phantom recall" in late 2008 to remove bottles of substandard Motrin from shelves, paying a contractor to buy up the subpar medication rather than announce a recall. In June, the chairman of the House panel investigating the recalls accused J&J of hindering the investigation, saying J&J was not coughing up the information needed. In July, the big January moldy-smell recall was expanded again to include Benadryl Allergy Ultratabs, Children's Tylenol Meltaway Strips in Bubblegum flavor, varieties of Tylenol Extra Strength, and Tylenol PM. In August, J&J CEO Bill Weldon announced that J&J was centralizing oversight to gain better quality control of drug manufacturing operations. Weldon told The Wall Street Journal: "We've learned a lot of lessons from this." In September, J&J honchos said in yet another congressional hearing that they weren't aware that the firm had ordered that embarrassing phantom recall of Motrin back in 2008. 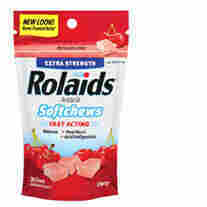 And on Nov. 15, J&J announced a recall of Rolaids Extra-Strength Softchews after customers complained of an unusual texture, which was "traced to crystallized sugar in the product," according to the FDA. All Junior Strength Motrin Caplets, 24 count, were recalled owing to "insufficiencies in the development of the manufacturing process," as were all Children's Benadryl Allergy Fastmelt Tablets in cherry and grape. Tylenol Cold Multi-Symptom liquids were recalled because the packaging didn't reveal that alcohol was part of the mix. These latest recalls throw more fuel on an investigation of J&J's practices by the House Government Oversight Committee. "We haven't gotten to the bottom of this yet," Jenny Rosenberg, communications director for the committee, told Shots. Stay tuned when the 112th Congress convenes in January to see if the change in congressional leadership lets the Pharma giant off the hook.